Alex Savin has just shared with us a pilot stereo 3D video for an upcoming short sci-fi movie called “WARP” that he is currently working on. This is an project for an indie sci-fi flick. Production is currently based in Finland, Tampere. Some time ago the team working on the movie was lucky enough to get a grant from the state, and this pilot is the result of their work. The actual movie is still ahead, but it might as well be finished during this year. The idea is to create a good looking stereo sci-fi flick with strong storyline and visuals combined. You are more than welcome to share your comments for the video here or in the Forum. I couldn’t see the mp4 file. With ou without any kind of codec. Just could hear the sound. Btw, it crashes my 197.45 nvidia driver. FFDShow should be able to play it, there is an MPEG2 version available in the forum post, you can also try with it. I used Cyberlink PowerDVD 10 codecs and it worked well. Nice 3D effects especially the titles, the animated star field and the empty square at the beginning of the movie. Not so impressive the painter woman (looks a bit flat and blurry). Just wanted to add the links here to the full HD MPEG2 version. It’s bigger in size, but it plays nicely. Heres the error that I get when trying to open with Nvidias 3D Vision Photo Viewer. Error: NVIDIA 3D Vision Video Player was not able to play this file! Reason: Could not render all streams. Maybe a codec necessary to play this file is not installed! Is there a better 3D video playing I should know about? 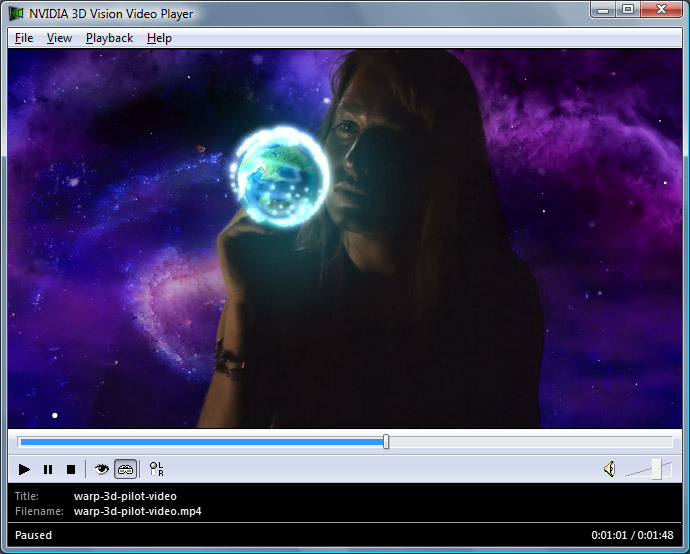 Correction: Nvidias 3D Vision Video* Player. Downloading movies from http://3dvision-blog.com/category/3d-movies/. I can’t seem to get the 3D to work properly on any of these videos using NVIDIA 3D Vision Video Player. I originally downloaded videos from http://www.nvidia.com/object/3D_Vision_Main.html which all seem to work perfectly.. so I’m kinda stumped on what to do to fix. Drivers are all current with card and 3D vision. Any info would be great! I’ll give it a try. I downloaded ffdshow but it still didnt work. I tried going into the settings and selecting the codec myself but I couldnt get it to work. I downloaded divx and it is able to play it, but it comes out doubled. I tried setting the codec to divx but it didnt work. Anyone know what Im doing wrong? I downloaded this video using Alex Savin’s links which download very quickly, thanks for them! Watched through the Nvidia 3d vision video player no problem, select file then select “open left and right file” add in the 2 parts of the vid and audio and then enjoy ; ). I must say I think this is currently one of the best 3d videos I have found online so thanks for the links Alex. K-Lite_Codec_Pack_590_Basic which solved a few other issues I was running into into. Able to play all videos though NVIDIA 3D Vision Video Player perfectly now. I’ll add though.. Anyone here think I’m loosing quality by converting to a .wmv? Video still looked great, but somtimes wonder if I’m shorting myself..
How can I watch this Stereoscopic movie with my Trioviz 3D Glasses?